Daredevil is a title that is knee-deep in dark and gritty, and there’s no denying that successive writers seem intent on outdoing each other when it comes to heaping misery on the poor unsuspecting Matt Murdock. Is this what makes the title work, as many would suggest? Or does painting oneself into a corner thematically put unnecessary restrictions on the types of stories that can be told? This is a common point of discussion among Daredevil fans, and I have made my opinion known on this subject on numerous occasions in the past. The way I usually put it is that Matt Murdock, as a character, is like a great actor who has been typecast into playing only one type of role. No one ever bothers to try to cast him against type because his regular gig has been a successful one and doing something different might seem too risky. At the same time, because the actor – or character in this case – is truly more versatile than what he’s given credit for, we as an audience are really missing out. While Daredevil writers are bending over backwards trying to find ever more imaginative ways of screwing up his life, the key to greater success and wider appeal for the character of Matt Murdock might lie in taking a step back and doing something truly radical, that is realizing that cutting down on the hyperbole and utilizing the many sides of Matt Murdock makes him a more interesting and relatable character. This topic is the source of frequent debate among Daredevil fans and before getting to the points I wanted to make here, I also want to point you in the direction of another post by Comics Alliance’s John Parker. I agree with almost every one of his points, except for a small detail I’ll return to below. Should Daredevil meddle in carefree swashbuckling camp or continue in the current vein of misery so deep that it borders on absurd? How about neither? I remember an interview with Ed Brubaker (though I can’t remember which one) from just before it was announced that he was leaving the book. In it, he acknowledged – as he had done before – that the Daredevil title was indeed quite depressing but that the fun carefree swashbuckler take on the character wasn’t what fans wanted. I don’t remember exactly how he worded it, but I remember reacting to the fact that he was contrasting two widely different takes on the character, appearing at opposite ends of the emotional spectrum of past and present Daredevil stories, and I was a little annoyed that he didn’t acknowledge the fact that there is a lot of ground between these two extremes. I personally don’t want the traditional “fun” superhero experience from my Daredevil stories. Cracking wise and joyfully bouncing all over town beating up silly villains in silly costumes just isn’t what Matt Murdock does. Every one gets that. Not venturing into that territory isn’t the same as having the character never catch a break, rarely smile or joke (though there are exceptions, see below), and straying further and further away from having any kind of normal life. Well, as normal as the Marvel U gets anyway. In fact, the nearly one-sided take on the character we’ve been seeing for the last decade – and it’s been a good decade, don’t get me wrong – risks making Matt Murdock into a parody of himself. Without letting the pendulum swing back into the light and giving the character some time to breathe and get back on his feet, each successive blow to his mental health and his loved ones loses its impact and leaves us wondering why he doesn’t just blow his brains out. Was Frank Miller’s run really that dark? Many would argue this is all Frank Miller’s fault, or rather, the fault of later writers trying to match Miller’s success by using the same elements that featured in his first run and, even more commonly, in Born Again. All the talk about how dark and gritty the Miller run was always makes me wonder how much of this view is actually inspired by Miller’s stories and how much of it is just a weird comic book meme floating around. It’s true that when Miller left the title, Daredevil had been transformed into a radically different character than he was when Miller first found him. His stories were edgier than anything that had been seen before with this title and they were indeed much darker and much more “serious” (for lack of a better word). At the same time, I would argue that only rarely during his run did Frank Miller reach the heights of relentless suffering that has so frequently been seen in later years. People remember the tragic death of Elektra and Matt’s troubled relationship with Heather Glenn, but there were so many other stories in the Miller-era that varied considerably in tone. The Elektra saga, with all its greek tragedy overtones, was most definitely a defining story arc, but I would argue that the average Miller issue had more warmth and humor in it than what we’ve seen in the last three-four years of Daredevil combined. In between having his long lost love bleed out on his doorstep and digging her lifeless body out of the ground, Matt managed to come across as a relatively balanced character. He was troubled, for sure, but often capable of coping well and even enjoying his life and his friendships. He even had the strength to reach out to others, such as Becky Blake and Melvin Potter, and help them battle their demons. It is often pointed out by people who, like me, are growing weary of seeing their favorite character constantly out of luck that Born Again actually ended on a high note, unlike most of Matt’s more tragic stories today. That’s a very good point, but I would also encourage anyone who hasn’t read the earlier Miller stuff in a long time to go back and read it again. More than likely, you’ll marvel at how much lighter those stories were than you might remember and how many happy moments Miller provided to balance out the tragedy of the darker ones. Modern writers would be well advised to do the same. Does all the current misery really make the title more grounded? This brings me to another common line of defense for the camp who insists that Daredevil, like good coffee, can never get too dark. Some people seem to hold the view that the tragedies that constantly befall Matt Murdock make the book more realistic and sets it apart from the fun and adventure of the traditional superhero comic (even John Parker of Comics Alliance, in the post I linked to further up, seems to make this point though I agree with him about the rest). In my mind, grounded can never equal melodramatic. True, all of us occasionally have drama in our lives (even though it’s not commonly of the superhero/secret identity/random villain tryin to kill our significant other variety), and many have experienced loss and tragedy. Bad times, like good times, are part of life and should influence what happens in a superhero comic aspiring for a certain degree of realism. But the appeal of the low-powered “regular guy” with a regular job who lives in a regular house that makes Matt Murdock so relatable is, for me anyway, diminished to a great extent by the fact that his life is now so overwhelmingly tragic that it makes Les Misérables look like a sit-com by comparison. I argue that, without a certain amount of balance, Murdock’s suffering becomes hard to relate to and make sense of. Sometimes I long for even the Bendis days (and those were tragic times as well) where we at least got the occassional glimpse of an ordinary life amidst the chaos. He was raised by a loving but imperfect single father with many issues of his own. He was bullied by his classmates and kids in the neighborhood (and there is very little to suggest he had proper adult support). He lost his sight at a vulnerable age, a life-altering event he had to adjust to (heightened senses or not) and which naturally affected his sense of self. He lost his father to violent crime at a young age (late teens going by Man Without Fear, and early twenties going by the original origin), leaving him with no real support system except Foggy. He’s lost one girlfriend to suicide, two to violence and his wife to mental illness. In at least three of these cases he would feel a great amount of personal responsibility and guilt over failing women he loved. How does someone cope with all of this? Some of these things have been addressed in the past, but these days Matt’s response to hardship seems to be to develop a bad case of PMS (I’m a woman, I can say that) or act like a sulking teenager. Seeing Matt actually try to cope with his life challenges in constructive ways would be so much more interesting. Even with Shadowland, which at the outset looked like it might provide us with a case study of what happens when all those unresolved issues come back to haunt you cut straight from Matt being his usual self to full-blown villainhood. So much wasted potential. 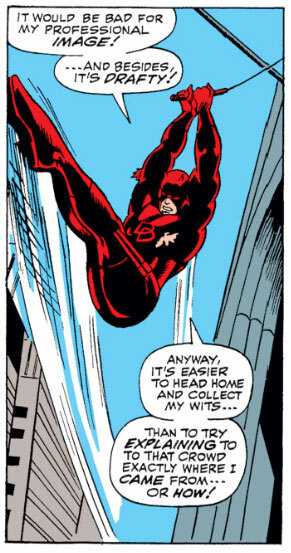 I’m going to cut straight to the chase: Daredevil is a book that would be well served by featuring more humor. I’m not talking about verbal villain bashing á la Spider-Man or full-blown situation comedy. 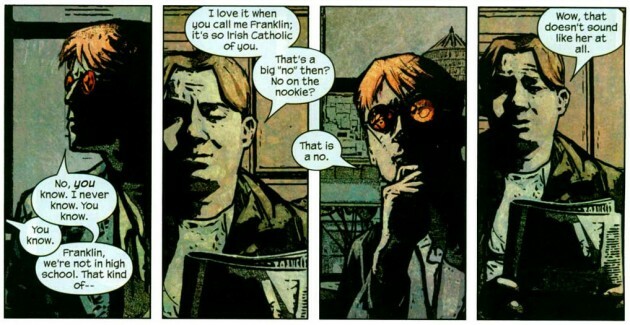 I’m talking about characters, more specifically Matt Murdock in this case, occasionally showcasing his wonderfully dry sense of humor (which we get a glimpse of all too rarely). You know, the way people in real life joke with people around them. I don’t know a single person for whom trading quips with friends and coworkers isn’t a perfectly normal aspect of life and a daily occurrence. Now I wouldn’t want any writer going overboard here (though I think that’s unlikely), but as a way to normalize the character and widen his emotional range? You betcha. I would never suggest molding Matt Murdock into a character he’s never been – and even though he was once a “poor man’s Spider-Man” I would never suggest we go back there – but the fact of the matter is that he evidently does have a very cool, understated sense of humor that fits even the darker tones of the book quite well. One recent writer on Daredevil who was successful in showcasing Matt’s wit was Brian Michael Bendis. 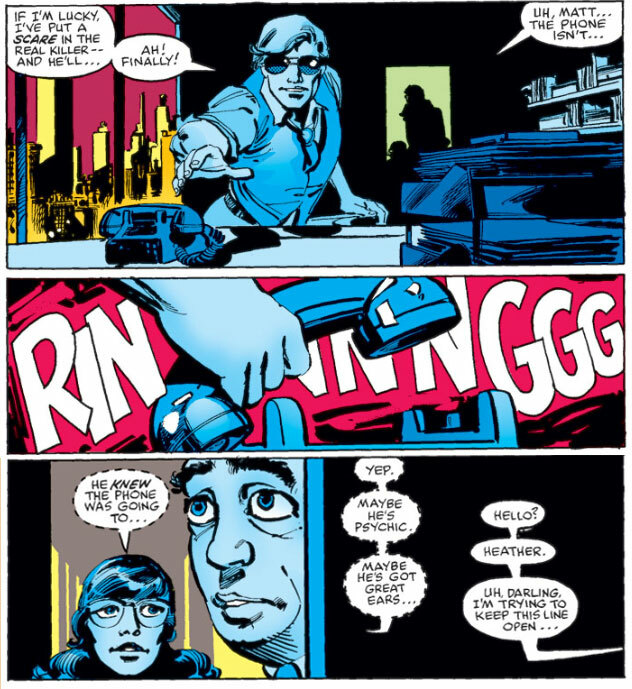 Going back further, the Kesel run (while occassionally over the top) also featured a main character with a sense of humor that was a good fit for Matt Murdock. What’s Matt’s sense of humor like then? Well, it’s dark and dry with undertones of sarcasm but often delivered with a certain amount of heart. It’s also often self-depricating. Matt has been known to make humorous observations about the superhero lifestyle and the troubles of living with two identities as well as joke openly about his blindness. His life is absurd on so many levels, and it’s to be expected that he would see the humor in it as well. Humor is also a great coping mechanism and would be a requirement for someone who’s lived through everything Matt has and made it to the other side. No one knows what the future brings for Daredevil (well, except for a few people at Marvel), or even if he will technically survive the month of November. Regardless of what happens, we know that he’ll rise again in some form, and hopefully get his title – or some other regular title – back shortly. When this happens, I do believe change is needed. Not necessarily very dramatic change, but a slight change in tone. If an organic story development means having to deal with the fall-out of Shadowland, then let future stories deal with that and let the character work through some of his unresolved issues for a change. Show us where his resilience comes from, where he gets his will to live and affect the lives of people around him. What I love about Matt Murdock is his depth and complexity as a character, and I’m looking forward to stories that tap into this complexity while remaining relatively realistic and grounded. I think creators should have as much familiarity and respect for the character as Christine has before they start spinning his life. Matt is complicated, from his powers and skills to his life and worldview, and the most talented writers and artists in the business will continue to piss off fans and waist their creative energy (Shadowland style) if they only see him on the surface level. He’s not just a novelty among the pantheon of Marvel heroes. Excellent food for thought. I agree with you, I think the character should be shown more half way between complete darkness and light. There are a lot of facets to Daredevil that simply haven’t been explored in a long time. Constant misery tends to drag the reader down, and probably puts most of us off. More balance is what’s needed, I think. speaking of Brubaker and Bendis, a curiosity arose; do you own all of their Daredevil omnibuses? I thoroughly agree with the more humor proposal: you know I lovethe Kesel period (which also had some pretty serious stories, as well), but I understand that, with the character’s evolution, we simply cannot go back to that… Still, as you say Bendis knew how to handle witty retorts. Just to set the stage for my comments below, I find that I am a huge fan of humor in comics. Indeed, all things being equal, I enjoy “humorous” books more than I enjoy “serious” books. (Oddly, I don’t read ASM though.) All things are not usually equal, so this certainly doesn’t mean I don’t dig the serious or dark story as well. After all, I love DAREDEVIL. Having said that, an argument can — and should — be made that DAREDEVIL should not return to a lighter style. To do so would be to, in effect, disrespect the continuity of the last 30 years. As Christine points out, Matt Murdock’s life has been filled with tragedy on a level rarely, if ever, equalled in the Marvel U. It strikes me as *realistic* that his outlook on life would become more and more resigned, humorless, dreary, and hopeless. While the Black Widow has long struggled with her “Widow’s Curse” (and seems to have overcome it of late), it seems that Matt Murdock puts her to shame: everyone he loves suffers and suffers horribly. (Foggy is perhaps unique in his ability to bounce back so relentlessly from these tribulations.) Given such a state of affairs, I think a “real” Matt Murdock *would* simply become the Punisher (or perhaps I should say the Advocate). At this stage, to work Matt back to a lighter tone would require an enormous amount of time and effort, detailing how on Earth he could recover from all these tragedies. In effect, we need a host of DAREDEVIL stories that take Matt *out of the costume* and have him deal with his life by confronting it on an emotional level. (I take this to be precisely what Christine is advocating above.) Something like this was actually undertaken by Ann Nocenti, when she had Matt travel aimlessly in order to rediscover himself. The reason that I believe this isn’t happening is that it’s not necessarily exciting storytelling. If I were a writer like Brian Bendis or Ed Brubaker or Andy Diggle, I think I would rather tell a story in which ninjas attack, Matt is outed as DD, Mr. Fear drives Milla crazy, and Matt takes over the Hand than tell a story in which Matt sees a therapist for ten years. When I am asked for a pitch by Marvel editorial, I would pitch the former. Further, if I were Marvel editorial, I would think that the former story would also attract a larger audience. P.S. I think hope should be found in the upcoming DAREDEVIL: REBORN. Unless that title is only meant very literally, a reborn Matt could be just the type of story to bring back some semblance of mental health. Wow, I could not have said it any better myself! Great post! You said basically every problem I have with the modern interpretation of DD. I am so glad you brought up the Frank Miller years. The first time my girlfriend read the Miller run, she was so surprised at how funny it was at times! All she knew of DD was the modern interpretation, so she was expecting this dark abyss everyone had described but instead was treated to a more balanced story that showed more aspects of Matt’s personality. People tend to remember Elektra dying in Matt’s arms and him digging her up, but conveniently forget the understated humor that went on when DD would visit Josie’s Bar or have run ins with Turk. The kind of humor you described is definitely needed. And I love it that you brought up that DD helped others deal with their demons during the Miller years. I couldn’t imagine the self-centered pug that Matt has become doing such a thing. The character has basically become a caricature so it’s going to take a new direction and lot of hard work to break away from that. I hardly think it’s disrespectful to want to put a little light back in to Matt’s life. As Christine pointed out, Miller was rarely as dark as any writer that followed him. What Matt needs is a balance, just like every human on this Earth. Light moments and dark moments. The only disrespect I see is all the writers that followed Miller putting Matt through the wringer time and time again with little to no regard for how this would affect the character in the future. I love the stories many of these writers have given us, but in many ways they have denied Matt his humanity all for the sake of continuity (more like what they thought was continuity). To me, that is truly disrespectful. They could do it as a limited series or something. Something other than the monthly book. I don’t think it’s necessary or feasible to spend a significant amount of time in the monthly series describing Matt’s mental health. Doing that for an extended period of time would kill the momentum of the book. Those that want to read that story will pick it up (most dedicated DD fans) and new readers won’t be bogged down with heavy intrspection while they’re trying to get to know the character. Do something similar to what they did when they started DD vol. 2. If they continue to make Matt darker I have no interest in the character. Just like everything else in the Marvel Universe, DD has become a caricature of himself. Nothing but a pale imitation of a great character. Thank you all for your responses! To clarify (I’ve discussed this with a couple of people on Twitter as well), when I mean that I long for something lighter and “more fun,” I’m not necessarily talking about a return to even the Miller run which probably would come across as too light by today’s standards. I actually think that Bendis struck a pretty good balance between serious (being outed etc) and Matt actually dealing with the things happening to him and struggling to go on with his life. There were some things I didn’t like about Bendis’s run, but the layering of light and dark, and serious and humorous, was something I appreciated. That run was also very successful while being pretty “adult” and cerebral. In response to Aaron, I would say that I understand where you’re coming from in saying that shifting into lighter gear now would feel strange, and I’m strongly advocating Matt actually battling his demons and coming to terms with things that have happened to him before moving on. However, this in itself would be a move in the right direction and it wouldn’t have to be in the form of a year-long therapy session either (though I think it would be sorta cool to actually have Matt see a therapist as a subplot and I think it could be done in cool ways). A skillful writer can incorporate both character growth and character healing in a bigger story, thus satisfying both the action only crowd (to an extent anyway) and people who want something a little more substantial. Daredevil has, for the last ten years, been to traditional superhero comics what edgy independent movies are to Hollywood blockbusters so I do think that the core fan-base includes many of the latter. What I will say is this though: If the character can’t move past the shitload of stuff that has happened to him, even if this means ignoring some aspects of “emotional continuity,” then there’s nothing left to do short of rebooting the entire franchise. I feel that the title is now so dark that there’s nowhere to go but up. If that can’t be done, then the character has been effectively destroyed and robbed of a massive amount of story potential. Something has to change. I agree with pretty much every point you’ve made Christine. The pendulum has to swing the other way even if just for a short time. As much as I loved Bendis and Brubakers runs, I’m very tired of reading “Born Again” over and over and over. Like you pointed out, Miller gets a lot of unfair blame for the the dark and gritty turn comics took in the modern age. Millers original run had tragedy but was also fun. Both “Born Again” and “The Man Without Fear” were dark, tragic, and visceral, but also uplifting and both ended on a triumphant high note. I don’t remember the last time Daredevil (or most any Marvel) story even had a high note. What you are describing here is a sudden return of Matt’s emotional roundness without the story of how the heck it came back. That strikes me as just as bad as what happened between DAREDEVIL #507-508. One second, Matt was a conflicted man trying to mold the Hand into a force for justice; the next he was a thoroughly evil demon. At the time, many of us wondered when the heck this happened! Likewise, if Matt were to miraculously appear “healed” without taking the time in DAREDEVIL to have this make sense, *that* is disrespecting continuity. You can’t ignore that he has been seriously traumatized just so you can move back to a less dark DAREDEVIL. (Well, you *can*, but it’s bad storytelling.) It has to be sensible. Having played devil’s advocate as much as I can, I hope wholeheartedly that Christine’s plea is taken up. If I got a year of Matt Murdock on the psychiatrist’s couch, I’d be happy as hell. Are there any super shrinks left? The only one I knew of was Dr. Leonard Samson (from INCREDIBLE HULK), but he recently blew up. Dr. Strange could certainly be useful for spiritual guidance, though he’s not a psychiatrist by training, but a neurosurgeon. Someone such as Danny Rand (Iron Fist) would be useful as well for exercises to aid Matt in his introspective journey. I suppose Charles Xavier has done this sort of work before, though I don’t think he is critically trained either. Heck, how about a trip out to the Chaste’s mountain to meditate with Stone and company? Or Master Izo & Elektra? As Christine noted, there are lots of good stories that can be written while still allowing Matt to probe into what is wrong with him and his life. I wasn’t suggesting doing what Diggle did in the transition to Shadowland. Matt definitely needs to deal with all that has happened to him. Not doing so would be, as you said, very disrespectful. Sorry, I wasn’t clear enough. I was reacting to the idea that Matt should spend a significant time in the monthly book speaking to a shrink with little to no time in costume, i.e. little to no action. Basically, I wouldn’t want to see his psych sessions take over the majority of each issue. As much as I want his issues dealt with, I still want to see him swinging around Hell’s Kitchen in the tights. Maybe that’s not what you were suggesting but that’s the way I took it since I’m sneaking around and reading this at work! I couldn’t agree more. I started reading Daredevil in the early 90’s so I missed out on Miller’s inital run and what many consider the “definitive” take on the character. I found the series when the “dark and gritty” Daredevil had become the norm so there’s a part of me that will always identify the character as being “noir” because that’s the way he was first introduced to me. But that take on the character HAS become the norm in the past 20 years and while I personally enjoy that take on the character, I can see all the wasted potential and impact stories like Shadowland could have if they had of just been executed better. As a fan of that “dark” Daredevil I first read about, I had to find out where it all started. I’ve since gone back and re-read the entire series (and Miller’s re-telling of the origin) from the start and it was shocking to say the least. The character first introduced by Stan is nothing like the character he became later. I actually really like that fact and it makes the character more appealing. But it also limits the storytelling oppurtunities if you just focus on the “dark and gritty” Daredevil as a status quo take on the character. The difference in styles, mood and character is shocking at first if you look at the “new” stuff based on the swashbukling character he first was. But you know what I loved about it? It actually made it more beliveable. It made the character of Matt Murdock/Daredevil deeper and more complex and therefore, more relatable. Because people change based on life experiences. So to see Daredevil go from that happy go lucky type to a more “gritty” style based on what happened is actually quite relatable when you read the comics as a whole. Things happen in life and those experiences affect who you will become. You can actually see that happen when you read the whole Daredevil run and the changes they cause in Matt himself. The fact Shadowland hasn’t addressed any of the past is a giant missed oppurtunity in my opinion. Daredevil is a very rich and complex character. “Shadowland” and Matt’s decent into darkness could have been much more rewarding if they had of refrenced the past history of the character. The ‘ideas” behind it are sound, it’s the “execution” of the story that has ruined it for me. There’s so much background material already given that could be used to show how someone given Matt/Daredevil’s life experiences could be lead down this path to this point that would make for such a historic story arc in the character’s life, but it’s been wasted in favour of making it a “mini-event” with the end goal of “Daredevil becomes Evil”. What really needs to happen with Daredevil at this point is a more low key version of what DC or rather Grant Morrison has done with Batman. Batman suffered from the exact same problem. Writers for 20 years tried to copy the “dark and gritty realism” of Frank Miller but too many left out the heart and the fun. Morrison still uses the more “gritty” mature elements from the modern age but mixes in a lot of silver age fun. That is what is missing from most modern comics: fun. Eventually the hero needs his moment of triumph. Without that there is no real point to reading hero comics unless you’re just a sadist. Imagine for a moment the movie “The Shawshank Redemption”, only instead of the ending given, Andy is crippled while being re-captured and spends the rest of his life in prison, and Red kills himself just like the other old man. Thats basically what Marvel comics has become.